SmartSync® Enterprise Software – Ironhawk Technologies, Inc.
To meet the challenges of the growing demand for data in an environment where bandwidth is becoming more limited by the day, Ironhawk’s SmartSync® Enterprise Software will reduce your enterprise bandwidth requirements. With bandwidth spectrum finite and nearing capacity, Ironhawk’s enterprise software with its proven track record in reducing the amount of data that needs to be sent, reducing transmission times, and thus reducing the overall bandwidth requirements for any enterprise, should be extremely helpful in managing your growing data requirements. Ironhawk’s software offerings have been specifically designed to offer various implementation choices to meet your needs. From server to server, client to server, HTTP Browser Plugin, or Software as a Service (SaaS), Ironhawk can address the needs of your enterprise. The SmartSync® software has evolved over the years to meet the needs of a very diverse and changing technology landscape. Since providing a data compression and distribution solution for Navy submarines and aircraft carriers the Ironhawk product portfolio has evolved into the SmartSync® 2.0 release which provides the latest cutting-edge technology to a world where more data is being moved than ever with increased use of the Cloud and mobile devices. Ironhawk’s goal is to provide the very best software tools to assist any enterprise to efficiently distribute this large amount of data using minimal bandwidth. 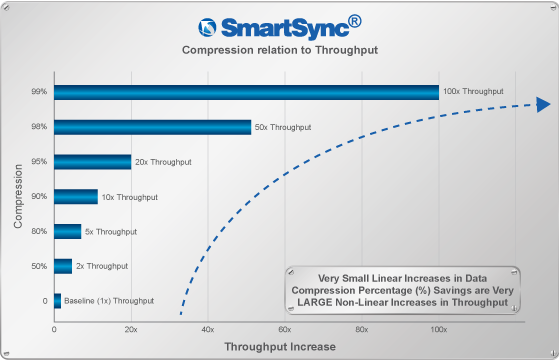 SmartSync® proven track record shows dramatic increase in the efficacy of existing bandwidth and corresponding bandwidth cost reductions. SmartSync® is available for most operating systems (Windows, Unix, and Mac) requiring no additional hardware or resources. SmartSync® Mobile available for any major mobile OS, such as Android or Apple iOS. SmartSync® can also be deployed as an HTTP plug-in for HTTP apps or web browsing. reduce data transmission size of a variety of enterprise data types and formats. SmartSync® SmartVideo add-on module re-encodes video streams at lower bitrates but with the same visual fidelity as alternative encoders on the market.Can be deployed as Software as a Service (SaaS) to better manage mobile data generated from IoT Cloud Applications.